Have you ever been asked to read Scripture during the main church meeting on Sunday? Have you been asked to read Scripture in a Sunday School class or other Bible study? How did it go? How should it go? 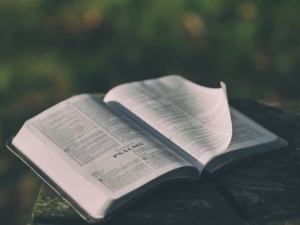 How should a person read the Bible publicly? Nervous people tend to read this way. Even if people aren’t anxious, most need to slow down. Remember, the goal is not to get done in order to move on to more important matters, but to read so that people hear clearly. Try this exercise: ask someone to listen to you read a chapter of Scripture, and find out if you need to decelerate. Keep practicing until you get the pace right. Give them a turn, also. Again, nervousness causes certain people to get quiet when given the opportunity to read. This more often may be the case when you are called on in an impromptu fashion. However, I wonder if some people think quietness in public reading somehow communicates reverence for the Lord and His word. I appreciate that sentiment, but the point of public reading is people actually hearing the Scriptures! Yes, there may be appropriate times for the reader to soften his voice for emphasis, but constant faintness will only frustrate the listeners. What might we communicate if we read Scripture without feeling and an inappropriate tone for the passage? Possibly that the Bible is boring. That the Bible is just another book. That people don’t really need to listen, and it isn’t worth their time to read on their own. But the Bible isn’t boring, and it’s not just another book, and people’s lives depend on its words! I’m not suggesting that you act out what you are reading. And it is possible for someone to speak with so much drama that people are distracted from the content. I’ll repeat my previous suggestion: practice reading with another believer—even a small group. Pick a variety of genres (poetry, narrative, etc.) and talk about the passage you are reading. What is the tone of the passage? What would be an appropriate way to deliver it? And then take turns reading. And if you know in advance that you will be reading on Sunday, practice beforehand. This may not be possible if you are asked to read on the spur of the moment. But if you know in advance, and the passage has names, find out how to say them. Where? There are books that you can buy for this, but you can do an online search and even hear an audio recording of how to say most names. You might want to print off the passage you are going to read with some extra spacing and write a phonetic pronunciation above any hard names. Just stuff the sheet in your Bible and read from it. What about genealogies, or other long lists of names? Should we read those? If you are asked on a whim, give it a try. The leaders should think about this in advance, though. I tend to think it’s okay not to have to read these. It’s okay for the people in attendance to be pointed to these names so that they can see them in their Bibles. However, some genealogies, such as in Matthew 1, are worth the extra effort to read publicly. One word of exhortation: let’s be gracious with one another when we have difficulty saying certain names (or even certain words). Some of these names are hard to say accurately even if you prepare in advance! There are 180 million people in the world who are still in need of Bible translation to begin in their own language (www.wycliffe.org/about/why). But if you are reading this, you probably have multiple Bibles in your home, and instant access to the Scriptures on your phone and/or computer. We are immensely privileged to have access to the Bible—a book unlike any other because every word is the Lord’s. Never forget how kind God has been in giving you a Bible. And when you are asked to read it, tell yourself, “I’m not just reading something that ultimately doesn’t matter—I’m reading the actual words of the living God! What a privilege!” Remember also those listening, that they need these God-breathed words just as much as you. That should inspire you to better, more thoughtful public Bible reading. “The unfolding of your words gives light; it imparts understanding to the simple.” (Psalm 119:130). Copyright © 2016 Steve Burchett.